As I sit here in my dining room, typing away, I can hear the frozen precipitation hitting my window. My cat, Mouse, is sitting on my lap, offering a warm blanket of love. My hands are a bit cold (we tend to keep the thermostat low), and Mouse doesn’t seem to mind when I use her as a hand warmer. In my case, another layer of clothes would do the trick, but to be honest, I don’t want to disturb my little kitty as she dozes on my lap. We are both fortunate in being inside on such a miserable night as tonight. I’ve often wondered how all of the creatures outside manage to keep warm and dry in this weather – or if it even matters to them that they are! 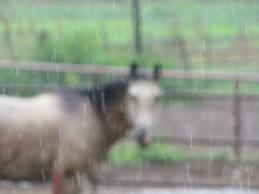 I remember our horse, Trixie, sitting outside in the rain, head down, tail facing the wind. Now, she had a nice barn she could have been in, out of the chilling wind, with a thick layer of straw to keep her warm. But she preferred to stay outside. Maybe the cold and rain just didn’t bother her; the fur she carried throughout the winter was thick enough. Or maybe she just was trying to enjoy her time outside; my grandpa would always pen her up in the barn for the winter. Another animal that doesn’t seem to mind getting wet are squirrels. I wonder if they use their tails as umbrellas to keep the rain off of them. The large fox squirrels in my brother’s yard in Saginaw are so fuzzy in the winter, and often hold their tails over their heads. Mike has been able to have the squirrels come up to him to take peanuts out of his hand. We’ve given Mike the name of “The Squirrel Whisperer” for his patience with the little guys. He’s got names for some of them, and after a few days, I’ve seen them often enough to recognize many of them. It’s amazing that creatures we assume look the same are, in fact, different and unique. My neighbor, John, has been hearing what he thinks is a great horned owl in our backyard. For some reason, I don’t see owls as birds that would be bothered by a little cold rain. I’ve no idea what a great horned owl sounds like, but I know I’ll be sticking my head out the back door in hopes of hearing one. I also read that there were some snowy owls in Ohio, just like in the Harry Potter movies. Hedwick, I think was the name of Harry’s owl. If I remember correctly, snowy owls aren’t commonly seen in Ohio, although they do occasionally show up. I’ve always thought owls were so fascinating to watch, with their great big eyes and heads that seemed to swivel around endlessly. When I was a kid in school, we took apart owl pellets in my science class to see just what the owls ate. I just remember thinking how tiny mice bones were! Poor Mickey and Minnie! 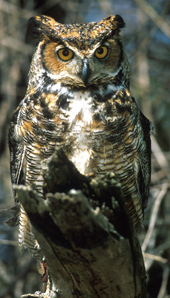 This entry was posted in General Information and tagged great horned owls, snowy owls, squirrels. Bookmark the permalink.